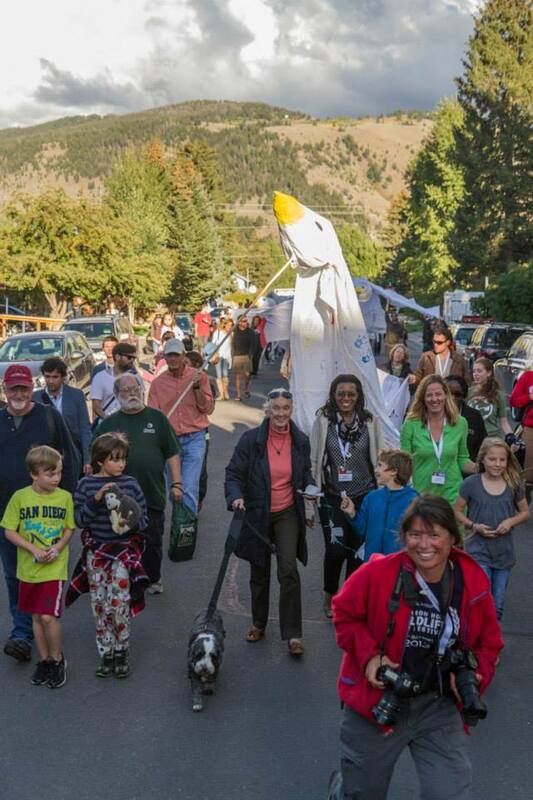 JHWFF’s Most Memorable Moments of 2013 – Jackson Hole Wildlife Film Festival: Our Blog has MOVED! 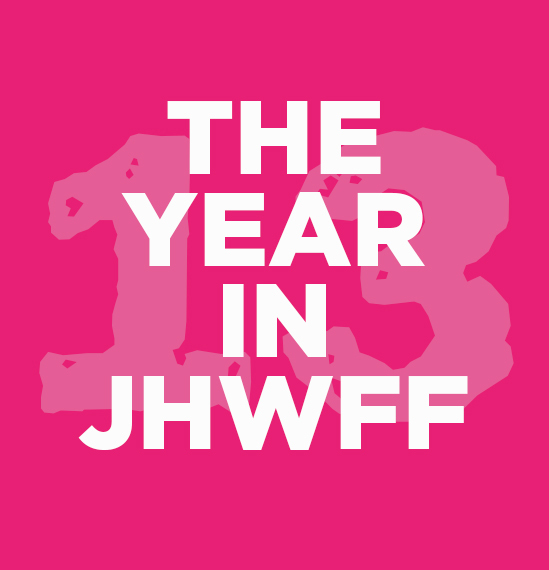 2013 has been the biggest and most successful Festival year to date, and our Team is deeply grateful for all of our friends of the Festival who supported our efforts every step of the way. Looking back on a momentous year, we want to share with you a few of our favorite moments from 2013 – we hope you enjoy! I never imagined that my dreams would come true, meeting my hero during the 2013 Film Festival. After waiting patiently, I finally had a moment to share with Jane how much I admire her; I could barely keep it together. After looking into her eyes and feeling her presence, I was moved to tears. She then looked me in the eyes and recited a variation of a Native American proverb that I had once heard before and loved, “Without tears in the eyes, there would be no rainbow in the heart.” Then of course I became even more blubbery and shared a warm hug and a photo with Jane. I will never forget this moment in all of my years to come. A big thank you to everyone who made it possible! One Day in Jackson Hole, a community crowd-sourced film project, brought filmmakers and orgs to film their experience during the same 24 hours on 12.12.12. On Earth Day 2013, One Day in Jackson Hole premiered to our community and to Kyle Ruddick, the founder of One Day on Earth – the project we received our inspiration from. Seeing how this film touched people young and old, from every walk of life in different ways really made the project come alive to me. I am humbled by the opportunity I was given to help organize and edit this incredible project. In the end, I was simply a facilitator – this was a film by and for the community, a gift back to each and every member in its own way. There were so many magical moments throughout the festival, but a fun highlight for me was the few hours that the staff and volunteers were able to take a load off and celebrate the Wildlife Film Festival in fine form at the National Geographic BBQ party. Producers, directors, tech volunteers, speakers and so on all relaxed and enjoyed each other’s company. The festival is not just for learning, but also connecting with amazing people from around the world! When I first met Jane, she was sitting quietly writing notes on a couch. The lighting was dim in the condo she rented, but her tight gray ponytail and bright smile gave her away. She liked the spinach hummus I brought from the Whole Grocer and so I brought some more. She made no fuss at all as she walked through the Center for the Arts to lead the Peace Parade around the town square. But the crowd couldn’t keep their eyes off her and everyone wanted a picture with Jane. Her only request was that the large doves made out of sheets and stuck to poles go behind her and that she had a dog to walk. “I have a dog,” I said, and I grabbed Kashi, my fussy Tibetan Terrier from the car. “Oh, no,” I thought, “I didn’t bring a leash.” So I grabbed my Wildlife Film Festival bag, unhooked the shoulder strap and handed her to Jane. I was worried that Kashi was being too nervous and pulling on the makeshift leash. But Jane was not. She’s used to much bigger dogs. “She’s better when you are around,” she told me. So I ran through the crowd with my dove on a pole and I broke the head off. I handed it to one of the kids to hide in the back. “Jane Goodall walked my dog today,” I posted on Instagram. The next day Kashi and I were on the cover of the paper with my daughter Dylan and her friend, Armando who got to hold Jane’s stuffed chimpanzee Mr. H. I was so nervous during the parade that I missed the turn around the town square and forced the Jackson Town Police to figure out a new route for us. I called Mr. H, Mr. T. “What an idiot,” I thought. Wasn’t Mr. T the guy who cut down all the trees on his property outside Chicago? When we arrived back at the Center for the Arts, the cameras were on us. Kashi decided this was the time to do her duty. She crouched under a tree. And I dismantled one of the plastic doves we made with garbage bags to pick up her poop. This is when I learned that her favorite animal is a dog. She couldn’t have been more gracious. 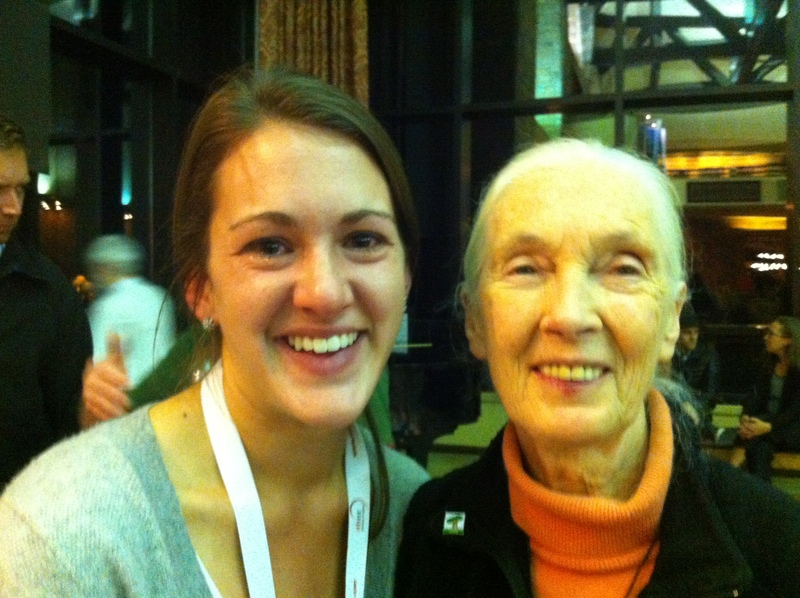 And a week later, I was delivered a hand-written thank you note from Jane Goodall.